force in various capacities since 1981. Mark Koller, a second-generation Hayward police officer, will be sworn-in next Monday as the city’s fourteenth chief of police. The ceremony will be held at the Hayward City Hall rotunda, Aug. 21, starting at 3 p.m.
Koller has served as acting and interim police chief since August 2016 following the resignation of Diane Urban. Hayward City Manager Kelly McAdoo announced last month that Koller would be given the job full-time following what the city called a national search for the position. 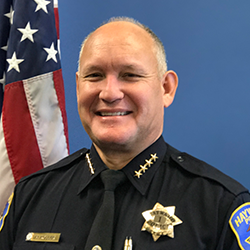 A Hayward native, Koller first joined the Hayward Police Department in 1981 as a police assistant and worked his way up the chain command to inspector and captain in 2013. Koller’s tenure comes during a time when the city and its large Latino community is facing great strain from fears propagated by the Trump administration and vows to deport undocumented immigrants. Last month some of the fears in Hayward’s immigrant communities were realized when agents from the U.S. Immigration and Customs Enforcement arrested two undocumented immigrants in the city. The individuals, however, were not who ICE were seeking, but two other men traveling to work on a weekday morning. The city and police department’s public response was swift and transparent, already an early departure from that of the former city manager and former police chief Urban. In a pair of statements from the city the incident with ICE was reported, including an explanation that its law enforcement had not coordinated with ICE, nor was it aware arrests had been made. Posted in Hayward, Hayward Police, ICE, immigrants, Kelly McAdoo, latinos, Mark Koller, police chief, swearing-in, undocumented. Bookmark the permalink. Will the Diane Urban Stuart scandal ever be revealed? That's real transparency that I would like to see. Now that truth challenged Fran David is gone, it is time to be honest with the residents of Hayward.